Vendors take to the ice at the community centre. 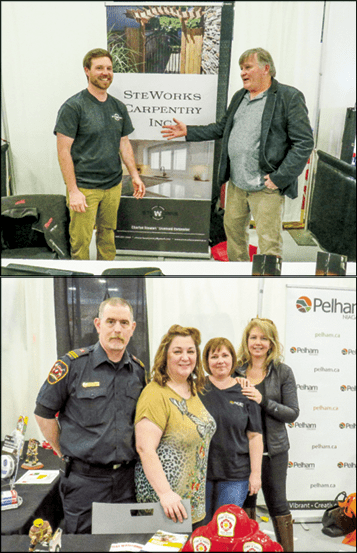 It was just about a capacity crowd that filled the new community centre this past weekend to attend the 24th annual Pelham Home and Garden Show. 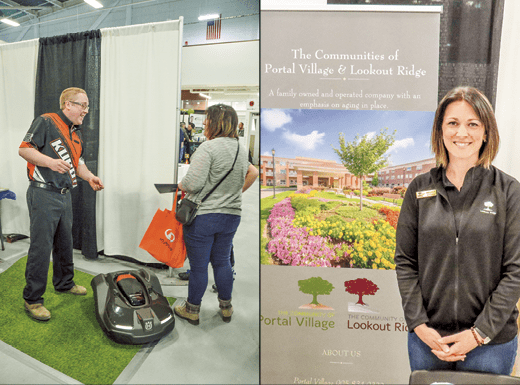 Hosted by the Kinsmen Club of Fonthill & District, the event brought together 81 vendors this year, an all-time high, many of them Pelham- based companies, to show off their wares and services. From left, Nicolle Lalonde, ready to tell you to save more, a lot more; cheery movers Brittany MacLean and Erin Pasma; Kinsmen Dave Ripley, Len Doyle, Brendan Young, Bert Leferink. Even though the event was called a home and garden show, vendors offered a wide range of services, including insurance, financial advice, hearing aids, barbecues, lawn equipment, hot tubs, flowers, home decor, and services including garage door installation, construction, and even funerary services. Previous years have seen as many as 1,200-1,300 come through the doors over the course of the event. 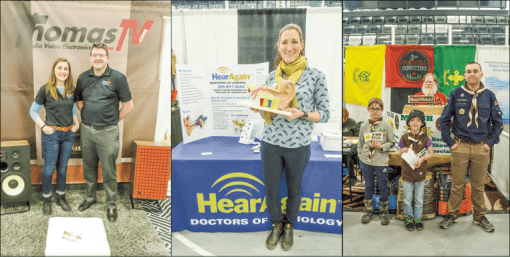 From left, showing off their classic JBL speaker remakes, Kaitlin and Tyler Thomas; always a crowd favourite, Alaina Hillier with her giant ear; Scout leader Kent Ratcliffe, with Brady McKendrick, Linden McLaren, and Ethan Rogers. By 1:30 Saturday afternoon, Kinsman Brian Iggulden said attendance had already matched the usual Friday and Saturday numbers combined from previous years. Freeland suspected the number of visitors could be even higher because the community centre also offers benefits that the old Pelham Arena on Haist Street, the venue for the show in the past, did not. From left, watch yer toes—Ben Berg’s Matthew Jansen and their new robot lawnmower; Lookout Ridge’s Melissa Stewart. Even first thing Saturday morning people had started to wander in from elsewhere in the building. Girls dressed in basketball uniforms clutched free bags and water bottles from various vendors. 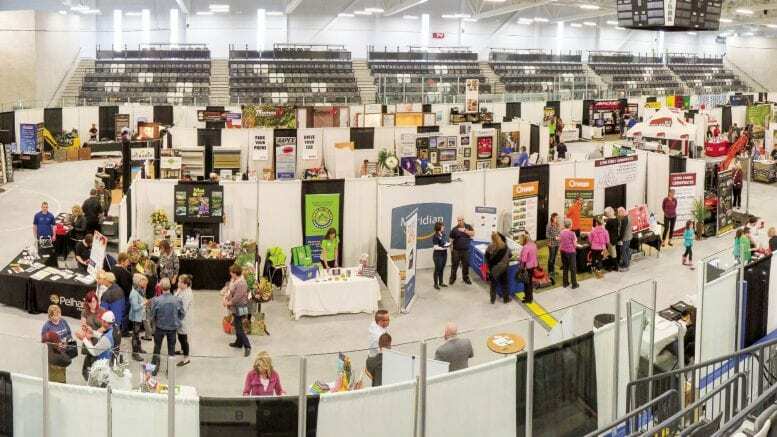 Since it was the first year that the show has been held in the new centre, vendors were eager to see the venue, many of them expressing their admiration of the facilities, particularly in comparison to the old arena. 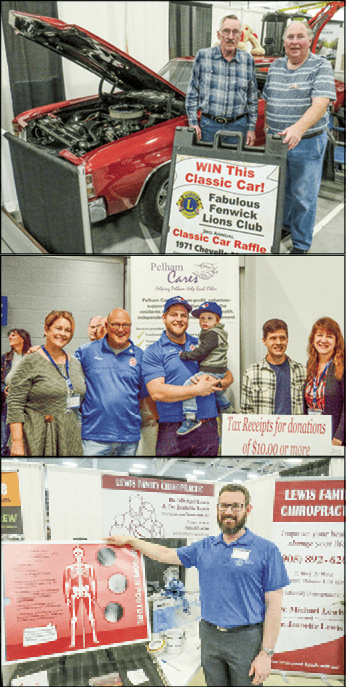 From top, Fenwick Lions Ken Angle and Paul Slattery, with their shiny Chevelle; centre: Karen Arthur, Dave Ripley, Ryan McKay and his son Hudson, Joseph and Cheryl Anne Vaccaro; above, Michael Lewis, ready to crack some joints. Matthew Jansen, a Pelham resident and employee of Ben Berg, a Wainfleet based company that sells farm and industrial equipment, said the change in venue was part of what prompted them to return to the show after an absence of a few years. He was also there to promote new equipment, including an automatic lawn mower that drew crowds of older citizens who stared in disbelief, jumping a little when it drove onto their toes. For the vendors it is a good opportunity to promote their business and make connections with the local community as well as other business owners. Although Kinsman Dave Ripley estimated that about 20 of the vendors were new to the show this year, many of the have been coming to the event for the past several years. Moe Beaudoin of Foundation Waterproofing said he has been coming for eight years. Just inside the entrance to the show, some members of the Pelham Garden Club could be heard laughing and joking, exchanging their favourite gardening quotes at their colourful booth. The Kinsmen asked them several years ago to be a part of the show. “They wanted to put the ‘garden’ back in it,” said member Trish Rybski. Jason Longhurst, Fire Prevention Officer for the Pelham Fire Department, said that they have been attending the event for a number of years as well. It is an ideal place for the department to promote fire safety. In addition to businesses, local community groups were at the event as well. The Fenwick Lions were selling tickets to win a 1971 Chevelle, whose bright red finish attracted many stares. They plan to donate the proceeds from their ticket sales to local charities, including those for therapy dogs. From top, “How are you at building giant arches?” Mayor Marv Junkin with Steworks’ Charlie Stewart; bottom left, firefighter Frank Lehmann with Town staff Teresa Quinlin, Mara Bray, and Jodi Legros. Elsewhere, Linden McLaren, a Beaver with the 3rd Fonthill Scouting, chatted with visitors and showed them how Beavers do a beaver slap, while handing out pamphlets for the Scouts’ mulch sales. “It’s great local community stuff,” said Mike Konderka of Enviro Niagara, this year’s title sponsor of the show. Overall, this is the Kinsmen’s goal for the event. 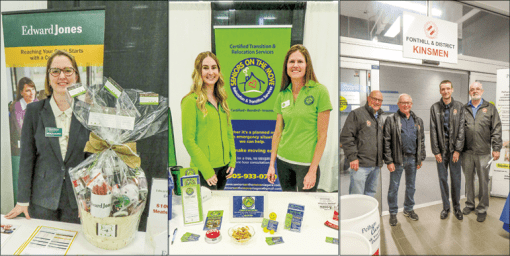 “The home show came about because we were looking, truthfully, for an event that would help us to bond with the business community and the community at large,” said Kinsmen Doug Freeland. For the first time the show had no admission fee, with the Kinsmen instead asking visitors to donate to Pelham Cares. Kinsmen Dave Ridley said he thought many attend because they know that the event benefits the community.